IBM® System z® servers offer a full range of connectivity options for attaching peripheral or internal devices for input and output to the server. At the other end of these connections are a variety of devices for data storage, printing, terminal I/O, and network routing. This combination of connectivity and hardware offer System z customers solutions to meet most connectivity requirements. However, to make use of these features, the System z server must be properly configured. 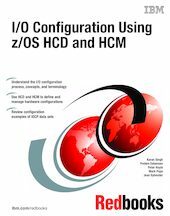 This IBM Redbooks® publication takes a high-level look at the tools and processes involved in configuring a System z server. We provide an introduction to the System z channel subsystem and the terminology frequently used in the hardware definition process. We examine the features and functions of tools used in the hardware definition process, such as HCD, CHPID Mapping Tool, and HCM. We discuss the input and output of these tools (IODF, IOCP, IOCDS) and their relationship to one another. We also provide a high-level overview of the hardware configuration process (the flow of generating a valid I/O configuration). We provide configuration examples using both HCD and HCM. The book also discusses available new functions and guidelines for the effective use of HCD and HCM. This document is intended for system programmers and administrators who are responsible for defining and activating hardware changes to z/OS® and System z servers, and for the IBM representatives who need this information. General knowledge of z/OS and IOCP is assumed.